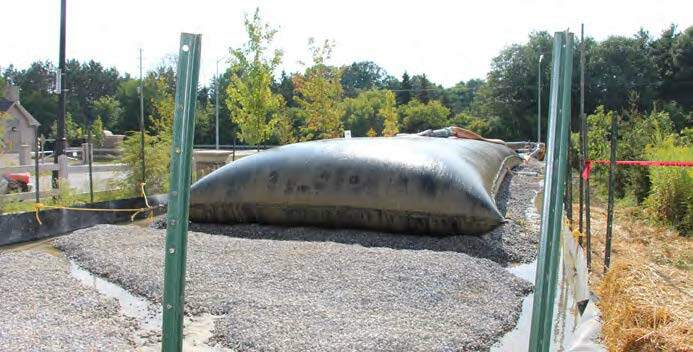 Layfield Environmental Containment is pleased to announce the successful completion of the dredging of a storm water pond located in the City of Vaughan (Greater Toronto Area), Ontario. The scope of the project included the dredging of Pond 4 and was carried out successfully and as planned with the removal of 1300 m3 of sediment. The total volume of sediment-laden pond water removed by the hydraulic dredge was 4,336 m3. Layfield was selected for this project based on their ability to provide an environmentally sound solution using a polymer assisted hydraulic dredging solution using Geotube® technology, which provided significantly less impact on the environment and the surrounding areas. Geotube® sediment dewatering tubes in combination with polymer technology facilitated water clarification and sediment consolidation during the storm water pond cleanout. The project was carried out as planned and on budget, with no significant delays reported by the project team. To learn more about this project and how polymer assisted hydraulic dredging technology works read the Full Project Profile. Layfield is a leading vertically integrated company that specializes in providing environmental containment systems and solutions. Layfield fabricates Geotube® containers in house. Our Layfield Service Group provides design assistance, testing, and installation services of Geotube® dewatering technology. Our products and services are commonly used by the Oil & Gas, Mining, Energy, Municipal Water, Agriculture, Civil Construction, and Waste Management sectors. Layfield has been in business since 1978 and is an ISO 9000 registered company.